Finally! Lolong, the great buwaya (crocodile) caught in the town of Bunawan, is recognized by Guinness World Records as the world’s largest crocodile in captivity. This confirmation came 7 months after a team from National Geographic visited Bunawan to measure the giant crocodile. The National Geographic team was led by the Dr. Adam Briton, who is a crocodile expert. Dr. Britton and his team hailed Lolong as the world’s largest crocodile dethroning Cassius from the National Geographic list. Cassius was captured in Australia and was considered as the largest croc before the discovery of Lolong. According to Guinness World Records website, Lolong measured 6.17 m (20.24 ft) and has a weight of approximately 1,075 kg (2,370 lbs). Lolong, the world's largest croc. Lolong was captured by the late Ernesto “Lolong” Coñate. The hunt was begun because there were reports that a crocodile in Agusan Marsh has eaten a schoolgirl and a fisherman. Coñate died before Lolong was captured by other crocodile hunters in his team. Local leaders of the town of Bunawan expect that the announcement of Guinness World Records will improve the town’s tourism. Lolong was placed inside an 800 meters pen and many people flocked Bunawan just to see the world’s largest crocodile. Crocodile hunters believe that there are other crocodiles in Agusan Marsh that are larger than Lolong. 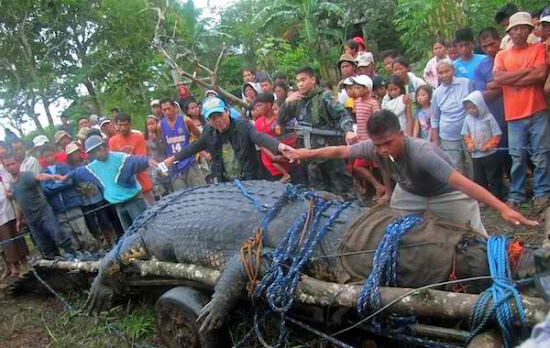 It is possible that Lolong will be dethroned by his kin in Agusan Marsh from Guinness Book of World Records. Visit Before the Eastern Sunset and read about Manila Zoo. Follow me in Facebook, Twitter, Tumblr, Pinterest and Flickr. I want to see Lolong someday. Hope Lolong will drive both local and international tourists. I want to see Lolong too, Analou. I think you have to visit Lolong soon because this crocodile will not be alive forever.